The Papale Eye Center team is committed to offering the safest and most effective treatment for cataracts. At our practice, serving Springfield and Western Massachusetts , we perform cataract surgery using modern surgical techniques that are designed to make your experience comfortable and pain-free. In just a few hours, we can gently remove your cataracts and restore your vision with minimal discomfort and maximum results. We are excited to offer our cataract patients many options for lens implants, including the ReSTOR® lens implant. With these lens implants, cataract patients can experience clear vision at all distances, even for close-up reading! To learn more about cataracts, read the information below or take the next step and schedule a consultation at our Springfield, Massachusetts eye center . A cataract is clouding of the eye’s lens that prevents the eye from focusing on lights, colors, and shapes, causing images to appear fuzzy or blurred. Cataracts develop in nearly everyone, but they occur more often in people with diabetes, and the only way to treat them is with cataract surgery. Although people can live with some cataracts if they are not that bad, if cataracts become worse, they can impede your vision significantly. A cataract cannot be treated with exercise, diet, or lasers, and it is not a film that covers the eye that can be removed. The most effective way to treat cataracts is to remove the natural lens of the eye and replace it with an artificial lens that is not cloudy called an Intraocular Lens (IOL). For more information about cataracts, visit CataractSurgery.com. 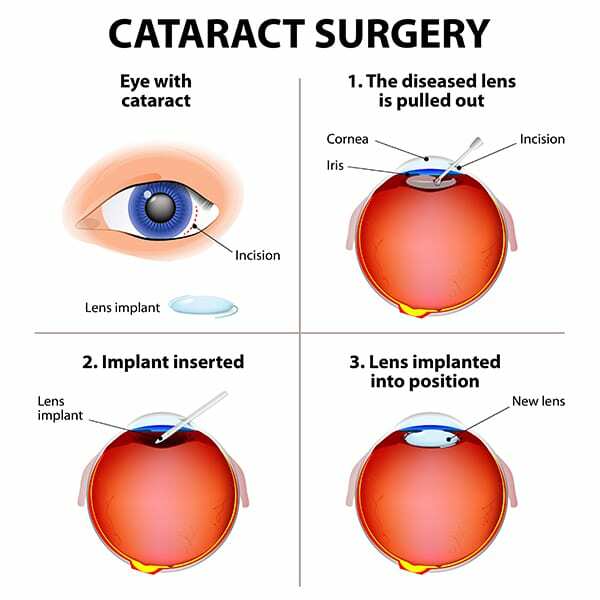 Cataract surgery is considered the safest and most effective treatment for cataracts. It is among the most commonly performed surgical procedures in the United States, with over 1.5 million cataract surgeries taking place each year. At Papale Eye Center, we perform cataract surgery on an outpatient basis. Then the cloudy lens is broken up and quickly removed. This cataract removal procedure is ultrasound-based and requires no stitching. A flexible lens replacement is then inserted through the incision and unfolded into place. This lens replacement is referred to as an intraocular lens or lens implant. Once in place, the lens implant naturally adheres to the eye. In the majority of cases, the eye incision heals on its own, requiring no stitches. After surgery for cataracts is complete, our patients can leave the eye center the same day. Recovery involves little more than resting at home. Will I feel any pain during cataract surgery? Cataract surgery has advanced to the point where there is little if any discomfort involved in the entire procedure. Many patients will not have to receive any injections to numb their eyes (anesthetic drops will be used instead) or deal with stitches to close the small incision in the eye (the incision will heal naturally). This no-stitch cataracts treatment technique, which was first introduced to the Springfield, Massachusetts area by Dr. John Papale, is not only safer for the patient but also produces less discomfort and quicker recovery. Why should I choose Papale Eye Center for my cataracts treatment? For years, Papale Eye Center has remained at the forefront of cataract treatment. We have gone out of our way to incorporate new technology into our practice to make cataract treatment safer and more effective. Our premier eye surgeon, Dr. John Papale has performed more than 10,000 LASIK and cataract surgery procedures over the course of his career. He is the surgeon of choice for many doctors and nurses throughout the Springfield, Massachusetts area. If you are considering cataract surgery, Dr. Papale and the Papale Eye Center staff will answer all of your treatment questions, assist you with financing, and help you explore the many benefits that cataract surgery has to offer, including clearer vision at all distances with the ReSTOR® lens implants. To learn more about cataract surgery and intraocular lenses visit our Tecnis Symfony IOL page. You can also contact our Springfield, Massachusetts eye surgery center today. Serving patients from Springfield, Chicopee, Agawam, Longmeadow, Ludlow, and Westfield, MA.